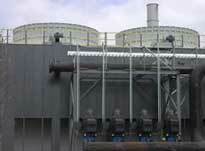 Cooling Towers | GEF, Inc. In reconstruction of existing towers, FRP products are excellent replacements for rot-prone wood beams and columns. FRP parts can be made to the exact wood dimensions when necessary. Standard inventory products such as SAFPLANK® are often used to replace traditional materials. Designing FRP to wood connections is also an important consideration in tower renovation. A "shop built" tower is a smaller tower that is factory assembled and shipped complete - ready for use by the customer. The HVAC market is the primary user of these types of towers. Standard or custom shapes can be used in construction of this type of tower. We are committed to growing this market with our standard and custom products, fabrication services and design expertise. 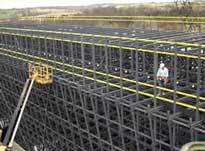 The use of FRP in the cooling tower market is growing fast. We expect this market to continue to show rapid growth for many years.